We don’t usually see news from Division II NCAA Football making anything but local news. 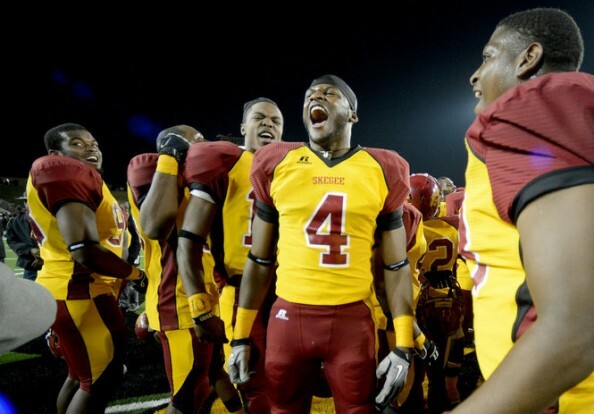 However, in the most recent playoff game between the North Alabama Lions and the Tuskegee Golden Tigers, a rare request made by Curtis Campbell, Director of Athletics for Tuskegee, shockingly accepted by the NCAA, pushed the sport and racial relations back into some very dark times. Tuskegee is a private, Historically Black University located in Tuskegee, Alabama. North Alabama is a coeducational university located in Florence, Alabama, and the state’s oldest four-year public university. Before the two school’s met in Florence for their playoff game, Campbell made quite an odd request. What was it? He asked, well more insisted, on the UNA (North Alabama) band and student section, along with the rest of the Lions’ fans, be moved from the stands opposite the press box, and forced to concentrate all in the press box side of the field. Why? According to him, most Tuskegee fans are black. Most of North Alabama fans are white. Allowing the two fan bases to sit together on the same side of the field would be risking danger, he said. This was a home game for North Alabama. It’s a seating arrangement that has been constant in recent years; NCAA guidelines were being followed. UNA officials, naturally, refused to comply with his request. There has never been any crowd problem at any NCAA playoff event or at any of the 27 national championship games played at Braly Stadium. So what did Campbell do? He called up a connecting in the NCAA. It took minutes, and no explanation was offered by the governing body of collegiate sports. UNA was ordered to move its band and students to the press box side of the field. This goes against everything the NCAA should be about, yet it granted these weird request. For no reason at all, the Florence community and the university saw its reputation smeared. Lets hope they don’t allow the NCAA or Campbell get away with it.